"I don't like black and white movies." At least that was my take on the medium when I was a little kid in the early 1960s. That changed by about age ten when I fell in love with a number of 1940s horror films. I'm talking about the Boris Karloff, Bela Lugosi, Lon Chaney sort of B-movie morality plays that bear little resemblance to the horror films of today. I'll never forget my first viewing of The Wolf Man, with Lon Chaney, Jr. To my young mind, the idea of an unwitting monster, tormented by the guilt of his own cruel acts, was a lot to take in. I'd never cared about the motives of a bad guy before, but Lon Chaney's performance in The Wolf Man both affected me and made me a fan for life. 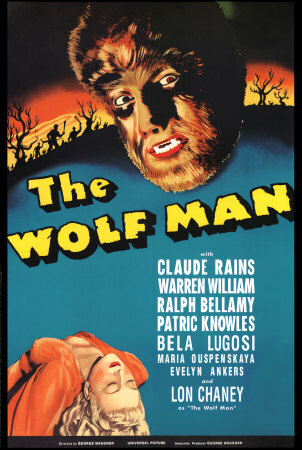 Movie poster for Universal Picture's The Wolf Man (1941), in the role that made Lon Chaney, Jr. a household name. Years would go by before I realized just how famous Lon's father, Lon Chaney, Sr., had been in the movie business. He was famous enough that James Cagney portrayed him in his own biopic (Man of a Thousand Faces). He is arguably best remembered for his magnificent work as the Phantom in the 1925 masterpiece, Phantom of the Opera. 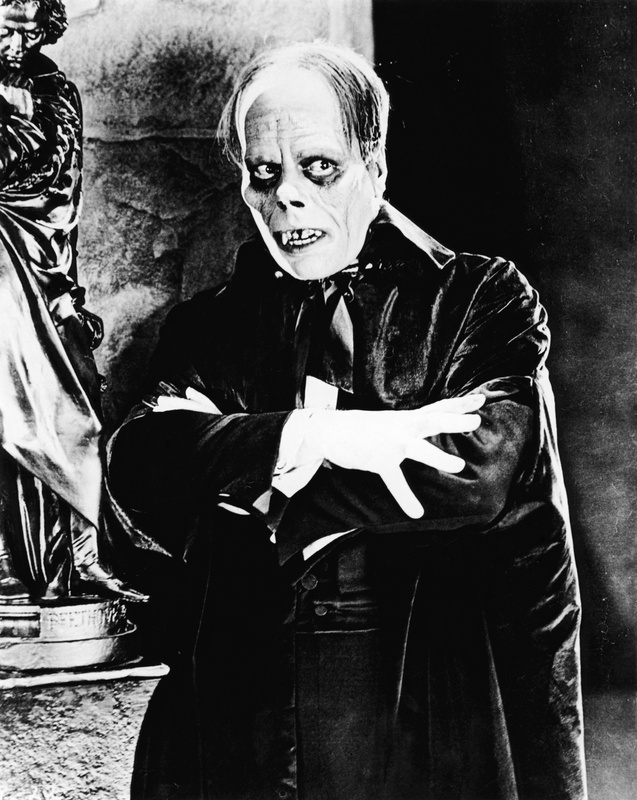 Lon Chaney, Sr. as the Phantom in Universal Picture's Phantom of the Opera (1925). It would be much later that I learned the story of Lon Chaney, Jr.'s harrowing birth-story here in Oklahoma City back in 1906, culminating with Lon, Sr. reviving his son's lifeless body in the icy waters of Belle Isle Lake. Recently I embarked on a journey of discovering more about Lon's ancestry. In doing so, I discovered a rich and colorful story that seems almost too far-fetched to be true. This little survey of Lon, Jr's ancestry will stop in the person of one of his great-great grandmothers, Margaret Ralston Kennedy. More on her below, but first, a chart that explains how Lon Chaney, Sr. and Jr. descend from Margaret . . .
Rather than recount the illustrious careers of the famous father and son, Lon Chaney and Lon, Jr., I suggest you visit the experts, stopping first at The Official Chaney Site (lonchaney.com) hosted by Chaney Entertainment which is operated by Lon Chaney, Jr's grandson, Ron Chaney, and his two daughters, Jennifer & Jaclynn. While there, I recommend you read the two biographies offered up for the father and son legends of the silver screen. For a quick glimpse of their vast contributions to the movie business, see their respective IMDB pages (Lon Chaney and Lon Chaney, Jr). Moving up the family tree, I'll start by pointing out the extraordinary parents of Lon Chaney, Sr.: Frank Chaney and Emma Alice Kennedy. Both Frank and Emma were deaf and mute, Emma from birth, or shortly thereafter, and Frank as the result of an illness which struck him at about age two. Frank was a successful barber and before they met, Emma taught at a school for the deaf. 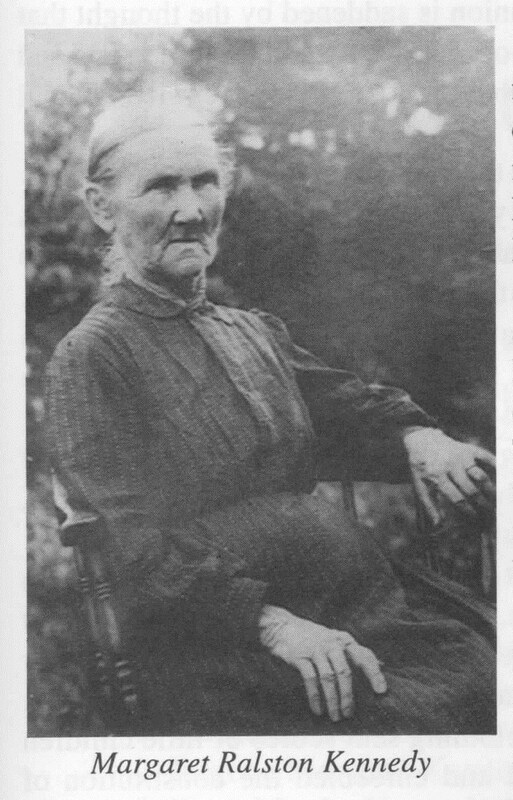 Emma's life was wrought with a host of physical ailments that brought her to an early end at only age 59 (sources vary on her birth year between 1854, 1855, or 1856). She died and is buried in Colorado Springs. Frank followed his famous son to Los Angeles and died there in 1927. Emma Kennedy Chaney's father, Jonathan Ralston Kennedy, was born into a close-knit clan in 1824, in Brown County, Ohio. Jonathan's father, Hugh, passed away in 1845. By 1850, Jonathan and other siblings were scouting locations in Illinois where the family might seek out better prospects. At different times in the early 1850s the family, including mother Margaret, lived in Schuyler and Fulton Counties, Illinois. By 1852, Jonathan had married Mary E. Jones and before leaving Illinois, the couple had their oldest two children, Oliver and Matilda. In 1855, the Kennedy clan migrated into the Kansas Territory, settling in Douglas County, whereupon Jonathan and Mary's third child, the aforementioned Emma, was born. Not long after their arrival, Jonathan, two of his brothers (Leander and Oliver), and his mother Margaret, all purchased the claims allowed to several different War of 1812 veterans. The family applied its industrious nature toward taming this wild, uncultivated land on the southern plains. Their new home was just south and a little west of the burgeoning community of Lawrence, Kansas. A place that a few years later would be center-stage for one of the most infamous events of the Civil War era. On August 21, 1863, the raid on Lawrence, Kansas was undertaken by pro-Confederate Missouri guerillas led by William Clarke Quantrill. Famous members of this band included Jesse James, his brother Frank, Cole Younger, and William T. "Bloody Bill" Anderson. An undeclared mini-war raged along the Missouri and Kansas border for the seven years prior to the Civil War. It's often referred to as "Bleeding Kansas", but that term understates the geographical scope since much of the action took place in Missouri. 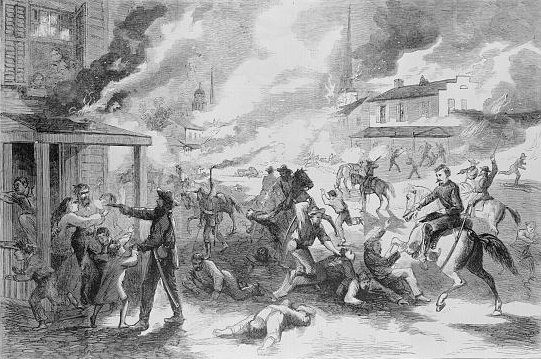 The Quantrill raid led to the deaths of somewhere between 185 and 200 men and boys, many of whom were unarmed. Quantrill's stated motivations were revenge for prior depradations in Missouri. This was the same stated reasoning for all the murder on both sides of the Kansas/Missouri border during the period, and the similarities between the area and the "Troubles" of Northern Ireland are remarkable. Vendetta earmarked the area more than any ideology, and the innocent were on the short end of the stick. To think that little six-year-old Emma Kennedy, grandmother of the "Wolf Man", lived only a few miles away from the Lawrence raid makes me take pause. I wonder if this young little deaf girl's fearful impressions of that era were passed down to later Chaney generations? It would be an interesting study in its own right. While Emma endured much hardship she was fortunate in that her father was not one to passively observe the struggles suffered by his three deaf children. Jonathan became a steward for the Kansas School for the Deaf in Olathe and after the family moved to Colorado, helped found the school for the deaf, in 1874, that went on to become the Colorado School for the Deaf and Blind. Read more about that story here. Lest we think Jonathan too urbane, I need to point out that he had an active role in the days of "Bleeding Kansas" and is credited as being among the rescuers of Jacob Branson, during an episode in the so-called Wakarusa War (1855). This first-hand account of the Branson rescue by James B. Abbott lists Jonathan on page 7. And finally we move to the matriarch of the Kennedy family, Margaret Ralston Kennedy. Born in Ohio, she married Hugh Kennedy in Brown County on June 20, 1820. A pioneer woman of the highest order, Margaret endured the harsh realities of being widowed in her mid-40s, migrating twice thereafter (first to Illinois, and then to Kansas), cultivating the unbroken soil of a newly-settled country, and then surviving the horrors of both guerilla-warfare and a Civil War. I'm not the first person to discover this fascinating woman. Linda Hubalek, historical fiction author and descendant of Margaret's brother-in-law, Michael Kennedy, has written a book focusing on Margaret's life. It is entitled Thimble of Soil. It is the second of three books which make up Hubalek's Trail of Thread series. Photo courtesy of Linda Hubalek; original at Watkins Museum of History, Lawrence, Kansas. So, the world-renowed Chaneys of Hollywood fame descend from a brave widow on the plains of frontier Kansas, a pioneer of education for the deaf, and two courageous souls who flourished in spite of their lifelong deafness. This KENNEDY-CHANEY family line has that uniquely American flavor to it, does it not? Stories of bravery, perseverance, and achievement, all stemming from the humblest of roots. Does it kind of make you wish you had a wolf-man in your family? The next time you travel through or over Kansas, Colorado, or Oklahoma, consider the marks left upon their histories by this amazing family. For those that subscribe to our historical maps service, HistoryGeo.com, log in and click the link(s) below to find out more. Douglas County, Kansas Land of Margaret Ralston Kennedy (Section 23) and sons. Sons include Oliver (Section 23), Jonathan and Leander (Section 27), and Thomas H. Kennedy (Section 19). Jonathan is the maternal grandfather of Lon Chaney, Sr. This is just a few miles south of Lawrence, Kansas. HistoryGeo.com is a subscription service for viewing and annotating a combination of original landowner and antique maps. Want to learn more? Watch our how-to videos! Township 13-S, Range 19-E, Section 23 (E½SW), Sixth Prime Meridian (approx. 80 acres). This came under the same patent described above. Jonathan R. Kennedy (grandfather of Lon Chaney, Sr.) acquired a single 160 acre parcel that lies just southwest of his mother Margaret's, in the NW quarter of Section 27 of Township 13-S, Range 19-E in the Sixth Prime Meridian. The veteran from whom Jonathan purchased the warrant is listed in the patent as "John Shepherd, Warrior, Captain Browns Company Cherokee Volunteers, War of 1812". How's that for a tidbit begging for further research!? Three of Jonathan's brothers also had parcels nearby with Leander's lying just south of Jonathan's, Oliver's lying due east of mother Margaret's, and Thomas's lying in Section 19, two miles east of his mother's land. Excerpts from what seem to be a couple of sources for biographies of Jonathan R. Kennedy, recounting his role in the "rescue of Jacob Branson" as well as involvement in the education of the deaf. Illustration depicting the Jacob Branson rescue (in which Jonathan Kennedy was involved). Margaret Ralston Kennedy entry at Findagrave.com. You'll note that the contributor claims Margaret's husband to be John R. Kennedy. My belief is that Margaret's husband is Hugh Kennedy (see marriage record just below) and the majority of researchers who've published their findings on the web seem to agree. Marriage record between Margaret Ralstin/Ralston and Hugh Kennedy/Kanada (FamilySearch.org). Indexed as 'Kanard'. See entry no. 252, page 69, of Brown County Ohio Marriage Book B, June 22, 1820.